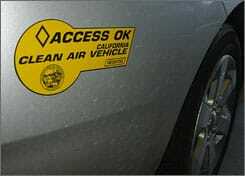 California Carpool Lane Stickers Are Worth $4,000. If you happen to own a hybrid vehicle and are planning on selling it, now might be a good time to do so! Turns out that those cars that have the carpool lane access stickers already on them can be worth up to $4,000 more than those cars that don’t have them. The reason? California did something brilliant….they capped the stickers at 85,00 and now there are no more available. The stickers that are on exiting cars are good until 2011, but as of right now even if you buy a new hybrid, you cannot get a sticker. Thanks California, now that is an incentive! Buy a hybrid, don’t get a sticker!